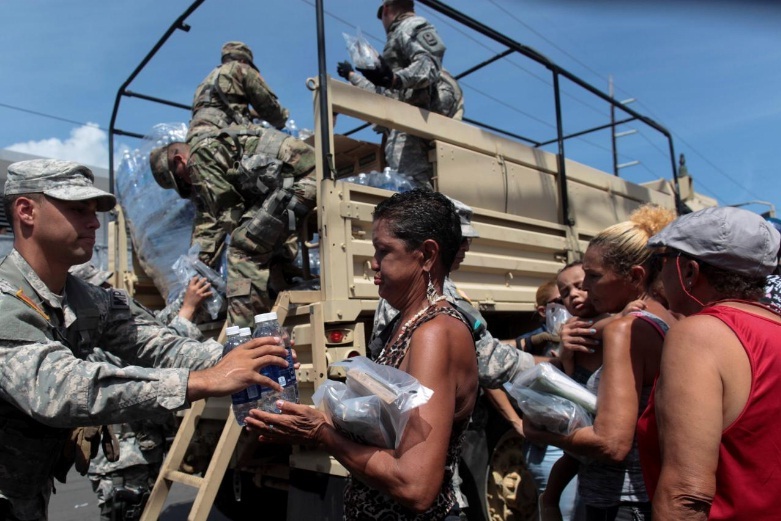 Soldiers of Puerto Rico's national guard distribute relief items to people, after the area was hit by Hurricane Maria in San Juan, Puerto Rico September 24, 2017. SAN JUAN, Puerto Rico - Hundreds of stranded travelers filled the sweltering halls of San Juan International Airport on Monday anxious to know when they could leave and reconnect with families after Hurricane Maria devastated power and communications across the island. Fearful of checking out of hotels in case they could not get on the few flights available, worried passengers waited in long lines at Puerto Rico’s main airport, struggling to get through to loved ones and airlines alike. “Everything is hearsay at the moment because there is no communication,” said 31-year-old Rene Kessler, a medical student from Baltimore, Maryland, preparing to spend the night in the airport ahead of what he hoped would be a flight back to the United States. Puerto Rican officials have confirmed at least 10 storm-related fatalities on the island, and the hurricane was blamed for at least 19 other deaths across the Caribbean, the bulk of them on the devastated island nation of Dominica. A microcosm of the battered island, the San Juan airport is a top priority in efforts by Puerto Rico’s cash-strapped government to repair the vast damage caused by Maria. Experts say the work will take months and likely run into tens of billions of dollars. Closed for days following the storm, the airport is a major test of Puerto Rico’s ability to transport people and supplies and overcome the communications vacuum that has plagued the island since the storm. María has also turned Puerto Rico, a haven for Caribbean islanders left homeless by Hurricane Irma earlier this month, into a disaster zone with virtually no power that many are now desperate to escape. A dam on the island has weakened by heavy rains from Hurricane Maria was in danger of failing, posing a flood threat to thousands of homes downstream. Some 70,000 people who inhabit a river valley below the Guajataca Dam in the northwestern corner of the island have been under evacuation since Friday after authorities warned the structure was in danger of imminent collapse. The fear of a potentially catastrophic dam break added to the extreme difficulties facing disaster relief authorities in the aftermath of Maria, which has claimed at least 29 lives across the Caribbean, according to officials and media reports. The National Weather Service in San Juan, the island’s capital, on Monday continued a flood warning for western Puerto Rico. Maria, the second major hurricane to savage the Caribbean this month and the most powerful to strike Puerto Rico in nearly a century, carved a path of destruction through the island after plowing ashore early on Wednesday. Severe flooding, structural damage to homes and the loss of all electricity, except from backup generators, were three of the most pressing problems facing Puerto Ricans, New York Governor Andrew Cuomo said during a tour of the island. New York is home to many of Puerto Rican descent. “It’s a terrible immediate situation that requires assistance from the federal government, not just financial assistance,” he said on CNN on Saturday. Even the island’s medical facilities have been left in precarious shape, with many hospitals flooded, strewn with rubble and running critically low on diesel fuel needed to keep generators operating. Evacuation to the U.S. mainland is the only option for some patients. The storm has caused an estimated $45 billion of damage and lost economic activity across the Caribbean, with at least $30 billion of that in Puerto Rico, said Chuck Watson, a disaster modeler at Enki Research in Savannah, Georgia. Hundreds of stranded travelers filled the sweltering halls of San Juan International Airport on Monday anxious to know when they could leave and reconnect with families after Hurricane Maria devastated power and communications across the island.